The department was founded in 2002 by a fusion of the two divisions of Computing Science and Computing Engineering. The Department is jointly organised by Chalmers and Göteborg University, under the organization of the IT University faculty board. The two divisions contain in all about twenty research groups. It is strongly international, with 70 faculty and 55 PhD students from 30 countries. It provides a dynamic research environment and has groups of world renown in a number of fields. The research spans the whole spectrum, from theoretical underpinnings to applied systems development. The department has extensive national and international collaboration with academia and industry. Industrial collaborators in Sweden include Volvo, as well as the many smaller IT companies associated with Chalmers. About 150 courses on Bachelors and Masters level are offered in a broad range of subjects: Algorithms, Computer Security, Dependable Computer Systems, Distributed Systems, Formal Methods, Integrated Electronic System Design, Interaction Design, Language Technology, Logic, Networks, Programming Languages and Software Engineering. Professor Devdatt Dubhashi (photo to the left) and Associate Professor K. V. S. Prasad (photo to the right) have both strong Indian connections since long time back, with an extensive network of contacts in major institutions, universities and industry research centres in India. They work mainly within the fields of – Algorithms for Information Networks; and – Language Technology. Devdatt Dubhashi graduated in Computer Science in India. He took his PhD at Cornell University, USA, and then spent two years as a postdoc at the Max Planck Institute in Germany. Devdatt then worked for two years as Assistant Professor at the University of Aarhus, Denmark, before joining the Department of Computer Science and Information Technology in Gothenburg (the Department is integrated between Chalmers University of Technology and the University of Gothenburg) in 1999. 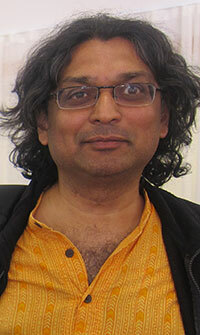 In 2009, Devdatt Dubhashi was appointed Professor at Chalmers University of Technology. He conducts research in the field of algorithms related to bioinformatics and optimization. Devdatt Dubhashi’s work focuses to a large extent on designing algorithms that are intelligent enough to handle the extremely large data sets generated by the accelerating pace of new technology. There are virtually no limitations on the use of the algorithm – on the contrary they are often a prerequisite for solving many of the problems that modern society brings with it. This means an infinite area of challenges for a researcher. Read more about his research. 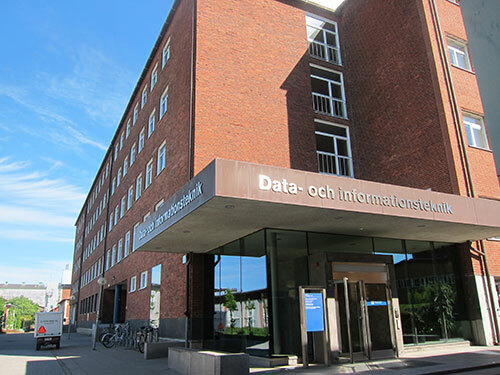 In April 2007, the Division of Computing Science received SEK 800 000 as an Institutional Grant from STINT for ”long term collaboration” with the Kanwal Rekhi Institute for Information Technology (KRESIT) and the Dept. of Computer Science and Engineering at the Indian Institute of Technology (IIT) in Mumbai. The persons in charge at Chalmers are Prof. Dubhashi and Dr. Prasad, while at IIT Mumbai it is Prof. Pushpak Bhattacharyya (photo). 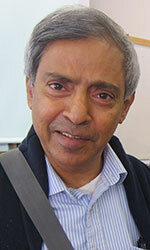 In 2011, Prof. Bhattacharyya spent a full year at Chalmers as Visiting Professor. KRESIT and CSE are two closely related units at IIT Mumbai, and are widely recognised as THE premier center for Computer Science research and education in India, with world class faculty and student bodies. The collaboration has focused on Linguistics and Computation‬, and the project has involved several faculty members, PhD and Masters students at Chalmers as well as at IIT Bombay. On Tuesday 4 June 2013, a workshop was held to discuss the results of the joint research project. It was organized in connection with the public defence of PhD candidate Shafqat Mumtaz Virk, who defended his doctoral thesis on the previous day, 3 June 2013 (more info below). This made it possible to include the guests participating in the defence as examiners, as well as some local speakers that have worked on related topics, to the workshop. It was introduced by Prof. Bhattacharyya, speaking about ”Cooperative Natural Language Processing”. He was followed by Gérard Huet from INRIA Paris-Rocquencourt, speaking about ”Design of a lean interface for Sanskrit corpus annotation”. Devdatt Dubhashi made a presentation entitled ”A Knowledge Based Approach using multiple kernels”. Other participants were University of Gothenburg researchers Markus Forsberg, Krasimir Angelov and Aarne Ranta. More information about the seminar. Shafqat Mumtaz Virk defended his doctoral thesis entitled ”Computational Linguistics Resources for Indo-Iranian Languages” on 3 June 2013. The faculty opponent was Dr. Pushpak Bhattacharyya, Department of Computer Science and Engineering, Indian Institute of Technology Mumbai. Shafqat has been supervised by Professor Aarne Ranta, and Dr. K.V.S. Prasad, while working in the Grammatical Framework group at University of Gothenburg. The thesis deals with the question whether computers can process human languages. 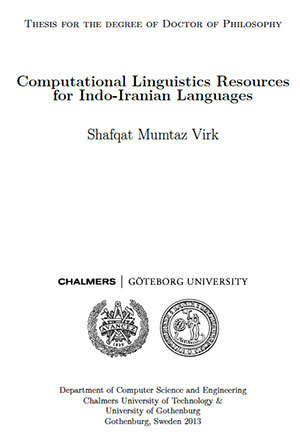 Virk elucidates the development of computational (”resource”) grammars for six Indo-Iranian languages: Urdu, Hindi, Punjabi, Persian, Sindhi, and Nepali. He also provides computational evidence of the similarities/differences between Hindi and Urdu, and report a mechanical development of a Hindi resource grammar starting from an Urdu resource grammar. He uses a functor style implementation that makes it possible to share the commonalities between the two languages, finding that sharing is possible upto 94% at the syntax level, whereas at the lexical level Hindi and Urdu differed in 18% of the basic words, in 31% of tourist phrases, and in 92% of school mathematics terms. More information about the thesis. Read the full-text PhD thesis. Dr. Chien-Chung Huang joined the department in 2013. He has recently been working at Max-Planck-Institut für Informatik in Saarbrücken, Germany. He has a long-term collaboration relationship with India, having visited it five times, giving talks. He has many active collaborations in India, especially with Associate Professor Kavitha Telikepalli at the School of Technology & Computer Science, Tata Institute of Fundamental Research (TIFR) in Mumbai. This has been very fruitful and led to several papers published in prestigious conference proceedings and journals. Dr. Huang as also collaborated with researchers at the Indian Institutes of Technology in Delhi, Mumbai and Kanpur. When Chalmers in 1979 celebrated 150 years, the government gave a Jubilee Professorship at Chalmers as a gift. The criteria to be met is that the holders will add Chalmers new skills and that the University’s international relations will be strengthened. The department of Computer Science and Engineering has hosted several of these Jubilee Professorships – in 2010 ​Professor ​Eli Upfal from Brown University, USA, and most recently in 2012 and still running, Professor Christopher L. Barret from Virginia Tech, USA. As part of the professorship, Barrett has helped develop new interdisciplinary projects on topics related to sustainable cities, social and network science, and socially coupled systems. He leads a transdisciplinary team of scientists from the computer science department and the School of Architecture and Urban Design at Chalmers, along with researchers in the Network Dynamics and Simulation Science Laboratory of Virginia Bioinformatics Institute at Virginia Tech. “We are excited to host Professor Barrett in our group during his stay as Chalmers Distinguished Visiting Professor,” said Devdatt Dubhashi, in an interview. “This provides us the opportunity to interact with Professor Barrett, Professor Madhav Marathe, and the Network Dynamics and Simulation Science Laboratory group at Virginia Tech, who have been world leaders in developing and applying core computer science concepts and technologies to high impact applications in transport, urban futures and public health.” Read more. Through Chris Barrett and Madhav Marathe from Virginia Tech, the department is also involved in research collaboartion with Professors Dinesh Mohan and Geetam Tiwari at the Transportation Research and Injury Prevention Programme (TRIPP) at the Indian Institute of Technology Delhi for transport and traffic modelling. TRIPP is an interdisciplinary programme focussing on the reduction of adverse health effects of road transport. TRIPP attempts to integrate all issues concerned with transportation in order to promote safety, cleaner air, and energy conservation. Faculty members are involved in planning safer urban and inter-city transportation systems, and developing designs for vehicles, safety equipment and infrastructure for the future. Activities include applied research projects, special courses and workshops, and supervision of student projects at post graduate and undergraduate levels. Projects are done in collaboration with associated departments and centres at IIT Delhi, government departments, industry and international agencies. • Yahoo! Research Barcelona and Univ. Pompeu Fabra, Spain. Ricardo Baeza-Yates, Director. • Computer Science and Automation, Indian Institute of Science (IISc), Bangalore. Dubhashi and Prasad both participated in SASNET’s workshop on ”The role of South Asia in the internationalisation of Higher Education in Sweden” held at Karolinska Institutet in Stockholm 28–29 November 2006 (full information about the workshop). Dr. K.V.S. Prasad was one of the key speakers in Session No. 4 on ”Best strategies for marketing Higher Swedish Education in South Asia, and for sending students to Higher Education in South Asia?”. On April 18, 2008, Dr. Prasad participated in a meeting with Lars Eklund and Sidsel Hansson from SASNET. The meeting was held at Chalmers. More information. 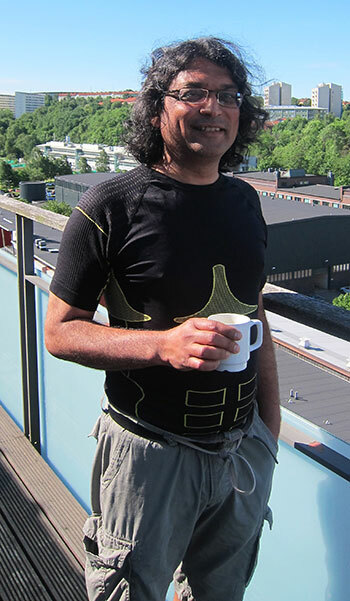 On Wednesday 5 June 2013, Lars Eklund visited Chalmers University of Technology and the Department of Computer Science and Engineering (CSE), where he met Professor Devdatt Dubhashi (photo).